Today’s guest columnist is brave. I’ll let his writing speak for itself, however, Clayton, I will say a) I have absolutely felt the same way, especially when there are people around the hockey circles we share who seem to never actually leave the rink at any point in their lives, and b) I’m jealous as hell that you scored a game-winner. I had my first ever penalty shot last Wednesday and couldn’t quite sneak it through the five-hole. Dammnit. Clayton Powell: part-timer made good. I can feel the boos and hisses raining down on me already. Perhaps I better go back to the beginning to explain. One of my friends told me that he was taking ice hockey classes. At first I thought he was pulling my leg. 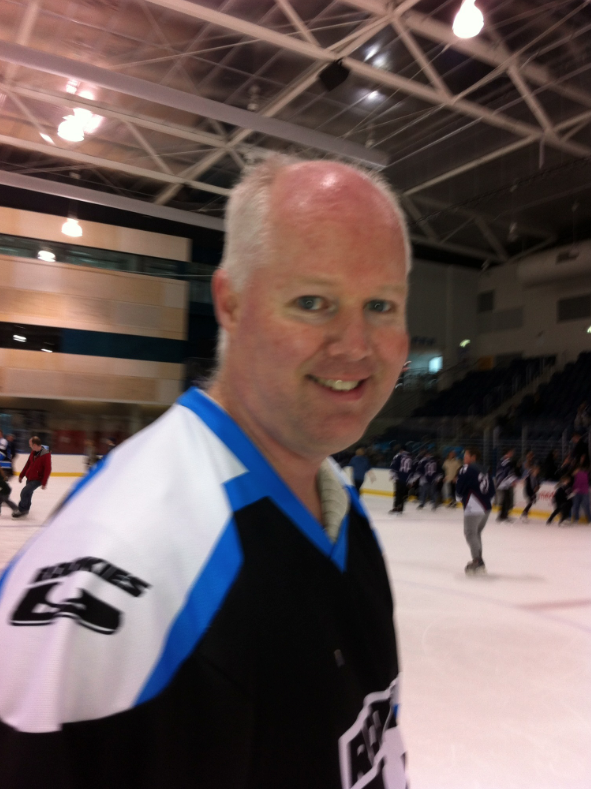 I didn’t even know that ice hockey was played in Australia, let alone that ordinary folk like us could play it. I was quite intrigued by this and after asking a few more questions decided to give this exotic sport a go. So I signed for a term of introductory hockey school. I really enjoyed the challenge of learning to skate and learning how to play the sport. But at the end of that first term I had a choice to make. Hockey was fun but I wasn’t going to progress much further using the hire skates. They were just too uncomfortable and felt different every week. So either I gave it all away or got my own skates. I decided I would probably never be any good at it but was enjoying it too much to stop. So I bought some decent skates. I then got a little impulsive and within a few weeks I had my full kit. Walking in to intermediate hockey school at the start of next term with a full kit of my own hockey gear felt really weird. I felt like an imposter. I was a barely adequate skater with poor puck handling skills. I had never played a real game of hockey and felt it unlikely that I ever would. I felt very self-conscious wheeling that bag in and tried very hard to put all the gear on correctly without asking any questions. The turning point for me came in the last week of the term. Our scrimmage game ended as a tie. So we had a shoot out. I was near the front of the bench at the time the game ended. The first five shots on goal were blocked and it all came down to the last shot. Me. I thought very seriously about letting somebody else take it. Who was I kidding? I’m not a hockey player. I decided I couldn’t do any worse than the five guys who preceded me so out on the ice I went. One on one. Face to face with the goalie. My main concern was not to lose the handle on the puck. After that it didn’t really matter. I couldn’t lift the puck and had no power in my shots so there was no way it was going in the net. I did a bit of a loop to get some angle and pushed the puck. By some miracle it went through the goalie’s legs. I was in a daze as I skated back to the bench with my arms in the air. My wife and two young children were outside the rink screaming and my teammates were skating towards me for high fives. And I began to think. I was really enjoying learning and playing but felt out of place. Maybe I’m not that good? Maybe I never will be great? But maybe, just maybe, there is a place here for me too? Some really good players took shots before me but I was the one who managed to get it done. In a team sport, everybody has something to contribute, no matter how small. Clayton on the ice: Army’s support was vital. A little while after this, while doing a general skating session, I bumped into Matt Armstrong. I began chatting with him about the different skating courses. I said I would probably be doing intermediate the rest of my life. There was no way I’d ever be good enough for dev league. Let alone an actual hockey club. He told me not to sell myself short. It was just a matter of keeping on trying and I’d get there. 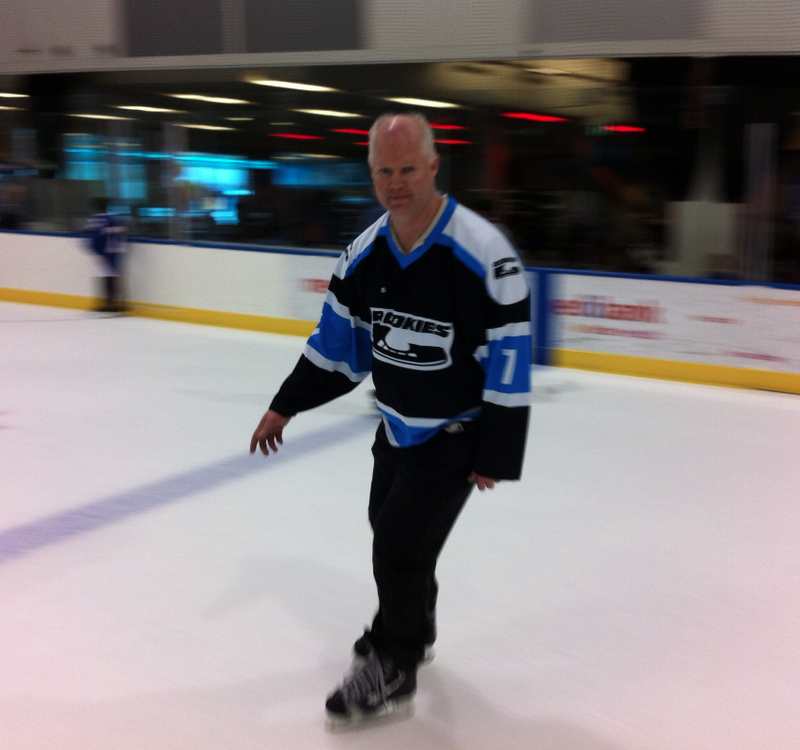 To be told that by one of the stars of the Melbourne Ice was a real shot in the arm. And the way he was completely approachable helped to bring down the barriers in my mind between us ordinary folk and the hockey players. After reading the other guest articles on this blog, I feel like an imposter all over again. Hockey has not changed my life. It has not saved me. I really enjoy playing hockey but it has not taken over my life. Having a young family and a mortgage means I have very limited time and money to devote to hockey. So, is their room for a part-timer among all the true believers? I sure hope so. With the rookies/spitfires making the prospect of playing on a real team a reality, I’m really looking forward to what this summer holds for all of us. Bring it on. I’m really glad someone made a post with this perspective, I have to say. I liked hockey for a while before I started going to AIHL matches, and as soon as I did, I found myself meeting all kinds of people who played hockey at all sorts of levels, and they all encouraged me to give it a try. And I haven’t. I like skating. And I admit, hockey looks fun. I’ve always been uncoordinated with a bat or a racquet, though, and I’m only marginally better with hands-on sports like football, so it’s hard to picture myself even managing to hit a puck. The main reason I haven’t taken it up, though, is that I KNOW I don’t have a fraction of the love and dedication for playing hockey that all the people around me do. I know I won’t care enough. I know I won’t be willing or able to put in the practice time it would take to develop the skills. But it’s great to think that there IS room for part-timers among the true believers, and that it’s possible to play hockey just for the hell of it, without it having to be a way of life. Great read. I just bought my first pair of skates, figure I’ll do the intro class a few times until I get more confident. The thought of actually playing seems pretty audacious to me, I get that imposter feeling all the time. Even during general skate sessions. But I’m enjoying it far too much to sit back and accept that it’ll just never happen. The journey is as much fun as the end point.